Chelsea barely evolved from the Jose Mourinho days to Carlo Ancelotti’s final season. The spine of Petr Cech, John Terry, Frank Lampard and Didier Drogba remained intact – Chelsea were an old side depending upon players who, whilst still capable of good performances, were probably all four or five years past their peak. The revolution started with Fernando Torres arriving a year ago (before Villas-Boas), meaning a younger, fresher striker, even if his form has been poor. Juan Mata and Daniel Sturridge operate behind him on the flanks – Mata was a summer signing, while Sturridge was already owned by Chelsea but is very much a Villas-Boas man, having started 14 league games this season, compared to just two in 18 months under Ancelotti. Deeper in midfield, Ramires was at the club already but still represents an element of change from Mourinho’s era, while Raul Meireles was brought in from Liverpool. Next, in late November, Oriel Romeu started to play at the base of midfield. It means that Chelsea could play a front six of: Romeu, Ramires, Meireles, Mata, Sturridge and Torres. None were a part of the side that won the league in 2009/10. But the defence had remained almost untouched from Ancelotti’s first season. David Luiz is the exception (he arrived a year ago) but he has started fewer league games this season than Branislav Ivanovic. At right-back there’s the Ivanovic / Bosingwa / Ferreira choice that Chelsea have had since 2008, while at left-back Ashley Cole has no real deputy, and has started every single one of Chelsea’s 49 league games since the beginning of 2010/11, partially explaining why his form has dipped – he needs to be rotated. There’s an argument that the front-to-back overhaul sums up Villas-Boas’ style of football. His main tactical preference is the use of pressing from the front and a high defensive line, although that has been reined in slightly. Still, Villas-Boas wants to play that way, his defenders aren’t comfortable with it. The signing of Gary Cahill is fascinating in this respect. Chelsea need a covering defender for John Terry, who looks uncomfortable without an intelligent defender like Ricardo Carvalho or Rio Ferdinand alongside him. The positionally aggressive David Luiz is clearly a similar case. Cahill is a very interesting player in statistical terms, and there is one particular thing he does more frequently than any other player. That is in the ‘offsides won’ category – which is recorded by taking the deepest defender when a side catches an opponent offside. Cahill has been the deepest defender when an opponent has been caught offside 1.9 times per game, more than any other Premier League player. And his previous club, Bolton, had the most prolific offside trap in the league. The two are clearly linked, but this relatively obscure statistic is crucial for a side like Chelsea, looking to play a high line. We’ve previously looked at how that means they’re catching opponents offside 160% more than last season (though the stats may have changed since that article). It’s not beyond the realms of belief that Villas-Boas is aware of the above statistic. If so committed to playing with a high line but without a defender to sweep behind Terry or Luiz, why not go and buy the covering defender in a side most accustomed to catching opponents offside? Defensive play is largely about positioning and therefore is difficult to record in numbers, so it is often hard to paint a picture of a defender’s style – but these stats do it perfectly. Cahill wins offsides (making him suitable for a high line), doesn’t get drawn into many tackles, but does make clearances and blocks (making him a covering defender). This is an argument purely in terms of style rather than ability. Whether Cahill has the pure ability to play for Chelsea is up for debate – he is yet to convince that he’s a top-class defender and is now 26 - but stylistically he makes sense. Cahill alongside Luiz, Terry or Ivanovic also seems a better fit than any of the other three combinations. It’s particularly interesting that Chelsea’s first game with Cahill is against Norwich; in the reverse fixture between the sides in August, Norwich caused Chelsea’s high line plenty of problems, with Grant Holt giving Ivanovic a difficult afternoon. It seems an appropriate game to assess how Cahill will fit in. 1) I don’t think Cahill is particularly good. I’m unconvinced he’s good enough for Chelsea. I’m commenting merely on his style and characteristics, not his ability. 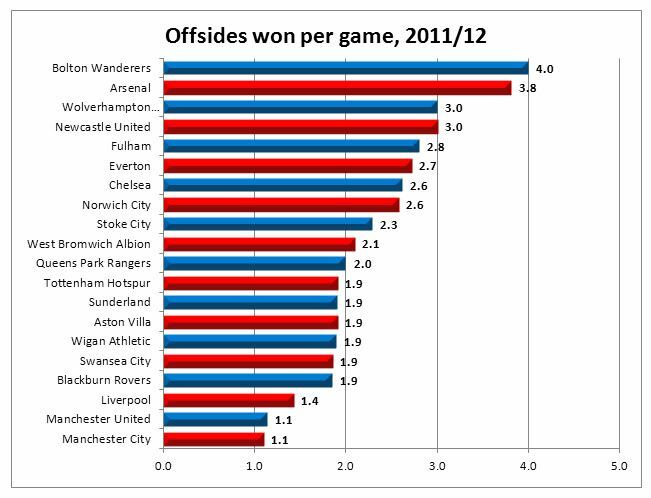 2) Offsides won – yes, it’s an obscure stat. No, it’s not meaningless. 3) Offsides won – no, it’s not necessarily a good thing, no attempt is made to say it is. It’s merely a thing that has happened and can be commented on. 4) The tackles / blocks / clearances – again, no-one’s saying these are necessarily good things. OF COURSE these stats are going to be dominated by players at the bottom of the league, who are in poor defences. That’s obvious. My point is not “Look, he’s good at blocks, he must be a good defender.” My point is that, in the worst defence in the league, he makes absolutely sod all tackles (but does get a lot of blocks in). If the counter-argument is “But he will get lots of blocks/clearances, he’s in a crap defence”, then why doesn’t he get lots of tackles in? Answer: because he’s a covering defender, not a proactive one. Which is the point. Over the odds? Even if his contract is running out in 6 months, I still think £7m is a very good price, considering Bolton were asking for around £18m less than 6 months ago. Because they were asking for that much doesnt mean he was truely worth that much. obviously the 18M was too much because no one paid it and he was sold for 11M less 4 months later. Did his value drop 11M in 4 months? If so why would someone buy him if he were less than half the player he was last season? The point was though that if Chelsea hadn’t paid that 7m now for him another club may have and Chelsea would have missed out on getting him as a bosman. So in a way for Chelsea, he was easily worth the 7m now. There are other clubs in the world.. I agree, my point isn’t to discredit him being worth 7M to Chelsea, but that is not his overall market value. So in my opinion they paid over the odds or above market value because he was a good fit. Does this not make sense? I will note there are a few more clubs in the world! Excellent article, thoroughly enjoyed reading it. Seconded. Why do we never get intelligent stuff like this on MOTD? Because it’s a show for all ages I suppose, and they’d prefer to show the good things a player does via the medium of Hansen watch/ some other pundit watch. Cos it would bore u to death. The correlations ZM comes out with are obscure and mostly irrelevant. Trying to bid up the intellectual stakes in a sport undetermined in decision making; based on stats is foolish and pompous. In many ways these rubbish articles are created to offer a binary to MOTD. Well done, also can you give me the the stat of how many calories Cahill takes v Chelsea avg and his shoe size. Good analysis – I think as a Bolton fan that you’ve largely captured his strengths. He’s also a better passer and goalscorer than the average center back, which are additional benefits to Chelsea. I agree with all the comments. Looking forward to his play with Chelsea. All excellent points. How quick is he? I haven’t seen him play very often and this would obviously be key for Chelsea, especially when Terry plays. No surprise to see Taylor top of the charts for blocks! Nice article – love the stats(!) and you make plenty of pertinent points. Good stuff. average player,just shows how far Chelsea have fallen.But we all know ZM is an EPL Fanboy who only covers DPL(Donkeys Premier League) games these days + an odd Barca game and he also hypes DPL players up. Are you a troll or do you genuinely have NO idea what you’re talking about? Out of 16 stories, you have SIX on non-EPL stories. The Milan derby, Rayo Vallecano (La Liga), Udinese-Juventus, Barcelona-Santos, Universidad de Chile and Luis Enrique at Roma. A story on Jose Antonios Reyes and one on the importance of Ozil to RM. And on top of that, I’m sure the games ZM chooses to cover have as much to do with what he has access to or what his customers (a.k.a visitors to this site) want/have access to: largely EPL games and a few big games like El Clasico in other leagues. And within this very article you’re so ignorantly commenting on, ZM specifically acknowledges that he doesn’t know if Cahill is of sufficient quality to play for Chelsea. All he’s saying is that he’s the logical, stylistic fit. He is an english writer who gets paid by and english paper(the Guardian) to write about the Premier League. It is amazing that he has the time to write about other leagues. I wonder if Cahill is more the long term Terry Replacement rather than the Carvalho Replacement the Blues have needed the last year and a half. Cahill = Terry far more than Cahill = Carvalho. If that’s the case, I’m not sold that Cahill + Terry back there is going to work well, at least in terms of Chelsea’s aspirations (league title and CL). Instead, it means it’s even more likely if it has issues that Terry will edge closer to the bench come summer and the team starts shopping again for their Carvalho replacement. villas boas should kill sturridge, essien and ramires! we don´t need black guys! Go back two hundred years when it was still good to think in stereotypes, prejudiced pigfucker. I must say that u’re DEAD already cos this is no Life! I would expect them to try to strengthen the squad with 2-4 players total which could increase their depth and attack/creativity. They already have an american CB lined up at 2.5M and have signed a striker on loan which I am sure this helped finance, and will most likely bring one or two more players. Club management(GM not coach) is always a gamble, we’ll see at the end of the season if they were right or wrong. It is a decent signing for 7m squid – and he is English too, and many managers like to see a mix of homegrown and foreign talent. I think he is a decent “all-rounder” – not amazingly quick, but not slow, decent positioning, decent tackling. Personally I think Villas-Boas was thinking that Terry and Luiz would make a good combo, in that Terry would be the out-and-out ball-crushing defender and Luiz would be the sweeper-type to bring it out of defence. But the problem is that Terry’s legs and head have gone, and Luiz is a head case. He might be OK over time, but I don’t see him turning into Baresi in the near future. I might be wrong. It will be interesting to see what Villas-Boas does with him. I suppose Cahill-Terry is the obvious choice, but maybe he sees Cahill as Terry’s replacement? I doubt AVB was ever surprised by what he got from Luiz because he has coached him for a long time. Luiz-Cahill as the long term pairing seems to be what’s in store. David Luiz was at Benfica, and AVB at Porto. AVB had not coached him prior to this year, as far as I know. If you do a quick comparison of offsides won per game versus goals allowed per game you will see that this season the teams which allow the fewest goals are not very good at the offsides trap (there are a few exceptions). Anybody care to comment on how useful it is to try and play for offsides? It is not about increasing offside stats, but about compressing the space available for the other team to play in. You can certainly find many examples, historical ones like Ajax and particularly Sacchi’s AC Milan. Highlighting the defensive qualities of tiki-taka football (Barca, Spain … Swansea) if you want to maintain possession, a secondary concern is how to win the ball back quickly. The general formula is a high pressure style of defense that uses a high-line to decrease the space the team needs to cover. The liberalisation of the offside rule has decreased the efficiency of the offside trap, but the idea of decreasing available space remains the primary concern. As a Chelsea fan, I’m baffled by the general opinion of David Luiz. He’s had a few blunders this year, but they’ve also conceded only 15 goals in his 21 starts, versus Chelsea’s 32 goals allowed in 31 total games this year. I understand that statistical variance in such a small sample is massive, but 15 in 21 is a sight better than 17 in 10, and at least suggests that he might not be the issue with the Chelsea defense. To my eyes, he’s made a number of terrible mistakes, a few leading to goals, but has been fantastic besides them. Cahill is not in David Luiz’s class of player. He has also been playing with a bit of a knee injury and was most likely rushed back in the absence of Ivanovic. I thought he played well vs Norwich. It is just me or am I the only one that thought John Terry was always the covering defender, even during his best days under Mourinho? Carvalho was usually the stopper, in that sense David Luiz’s playstyle is pretty similar, just that Carvalho is a million times smarter with his positioning and decision-making. Well, it’s not related. I would be very much interested about an article on ancelotti’ PSG 4-3-2-1. A pointless article with meaningless statistics. Who’s to say that you couldn’t stick Vidic or Kompany into the Bolton defense and see comparable statistics to Cahill’s? Furthermore, to say that Cahill will fit into Chelsea’s tactical game plan because of his statistics is misguided. I. “Offsides for deepest defender.” What a worthless statistic. Could it be that he has racked up that number because Bolton has the worst defense in the EPL? The same can be said for the average number of offsides. Why not buy a player accustomed to sweeping up on defense? That’s easy — put any number of defenders in Cahill’s position and they’d have similar numbers — maybe even Terry or Luiz. II. “Tackles, clearances, and blocks.” Again, totally meaningless. Look at who else has comparable numbers. Those would be defenders on teams that can’t defend. If you were to put Vidic or Kompany into the Bolton defense and have them play as covering defenders, then yes you would see similar stats for them, but that would just be proving ZM’s point (which is that these stats suggest a good covering defender). I. the stats actually suggest that you’d need a very good and disciplined defence indeed to be able to have just one man rack up that statistic, the line of defense would need to be communicating well and understand eachother, so when the time comes to push up no-one’s arse is hanging in the wind. The fact that Cahill’s the furthest back tells us where his position on the pitch is during the phase of play when Bolton spring their offside trap, usually covering defenders are furthest back to swep up loose balls and deal with the pacier players of the oppositions front line. So this stat is very useful. The fact that Bolton seem to have good communication at the back doesn’t necessarily mean they’re good at defending as a team, which their league position shows I suppose. II. Notice that they are all very well thought of defenders, however. To suggest that Mertesacker, Steven Taylor (part of one of the best defences of the season til he got injured, for the record), Samba, Hangeland, Shawcross, Johnson, are actually bad at their jobs because their teams haven’t been performing is to somewhat misunderstand the way these stats are being presented. Just because Arsenal shipped load of goals, Blackburn have been abject, Fulham are flopping in the bottom-half etc. doesn’t mean these defenders haven’t been performing their jobs well. But really it’s the fact that Cahill has appeared in the top 5 of ALL of the stats that makes ZM’s point, Cahill is a defender whose style and instincts appear to make him a good choice for AVB. That doesn’t have to mean the Bolton team as a whole (or any of the teams represented by the players in the stats) defend well as teams. The article’s point is that these statistics illustrate that Cahill is someone who will fit into Chelsea’s defensive system. They don’t. All they illustrate is that defenders on teams who concede higher numbers of goals have higher numbers of offsides traps won, tackles, clearances, and blocks. Furthermore, for Chelsea, a team who wants to become a ball-playing team, I think a better measure of Cahill’s usefulness to the tactics of the team would be his ability with the ball. I mean, this article would be like assessing the usefulness of Gerard Pique to Barcelona because of the numbers of offsides traps, tackles, clearances, and blocks he makes. No, while teams with lots of possession won’t win many offsides or have as many tackles, blocks etc, the number of offsides directly relates to a teams style of play, ie. they play a higher line, which is what AVB wants to do. You’re not making any sense. If Chelsea wants to become a ball-playing team, a style you concede doesn’t win as many offsides, tackles, blocks, and clearances, why are Chelsea buying a defender who wins a lot of them? Is there really any relationship between playing a high line and needing to win offsides traps, tackles, blocks, and clearances? I don’t necessarily think so. While I’m certainly not familiar with how high a line each of the teams in the “offsides won by team” graph plays, I would wager there’s no correlation between a high line and the number of offsides, tackles, blocks, and clearances won. The only correlation that seems to exist is that if your team can concedes a lot of goals, you’ll have higher numbers of offsides, tackles, blocks, and clearances won. In any case, I think this whole statistical analysis is kind of bunk anyways: the difference between these teams is about one offsides call per game. You might be right that he’s not as good enough on the ball for a top side but this article is about him as a defender. It SUGGESTS that he knows how to play a high line and how to cover rather than just win the first ball. ie. less tackles, more blocks. Sorry — I have been saying winning more tackles. You are right — he wins fewer than most. Aren’t blocks won around the penalty area? If not, there’s no context to any of the stats regarding Cahill’s blocks — are they won up the field or near the penalty area? The same goes with clearances. What do those have to do with playing a high line? Nothing. The only statistic I would consider meaningful to playing a high line would be interceptions. Again, you’d need some sort of context behind that statistic, such as whether the interceptions are being made during transitions or higher up the field versus near the penalty area. could you please tell me where you get these stats from? I have searched for quite a while but I can’t find any useful statistics on the web besides pages like http://www.soccerstats.com, for example. I am interested in stats like the one you used above or how many corners a team has per game in average etc. Or are these resources only available to journalists? 4) The tackles / blocks / clearances – again, no-one’s saying these are necessarily good things. OF COURSE these stats are going to be dominated by players at the bottom of the league, who are in poor defences. My point is not “Look, he’s good at blocks, he must be a good defender.” My point is that, in the worst defence in the league, he makes absolutely sod all tackles (but does get a lot of blocks in). It’s not whining; it’s criticism. If you can’t handle criticism, you should probably get out of the writing business. I like your site a lot, but that doesn’t mean that you don’t write a dud from time to time — this one being a big dud. You haven’t done a good job of connecting those statistics to anything. All you’ve done is merely thrown them out there without context and made some broad generalizations based on them. Maybe he doesn’t get tackles in because he isn’t good at making tackles or because his coaches tell the team to resist making tackles. There are other reasons behind his low tackling numbers, obviously, so to draw a conclusion that he is a covering defender based on statistics is meaningless. Yes, I’ll say the word again: meaningless. Awhile ago, you had pictures of player positions accompanying some of your articles. That would have been a more valid use of information to construct an argument around Cahill being a defender. I mean, really, all you need to do is watch him play and you’ll know whether or not he’s a covering defender. Well, then that’s interesting in itself, then. And if he isn’t good at getting tackles in, so doesn’t try to, then that’s making roughly the same point. Well, that’s not the case. Bolton have the fourth-most tackles in the league. So what is your theory? What are they then?! Your argument is basically “your reason might not be true, there might be another reason” without actually putting forward a reason. For someone who keeps throwing out the word “meaningless”, I’d have thought you’d at least try to do better than that. Pft. He did a fine job of connect in the statistics to reality. Your “criticism” is both unwarranted and unconvincing. It is in fact your assertion that “there are other reasons behind his low tackling numbers, obviously” that has no evidentiary support – we won’t count your absurd speculation that “his coaches tell the team to resist making tackles” as evidence, “obviously,” because it makes no sense whatsoever. As for the pictures, we can blame the leagues/teams/licensed broadcasters, as they jealously guard the images they’ve paid for and don’t see the fair-use value of posting them on this site. I have put forward a reason, that being, the statistics you present don’t necessarily have any relationship with being a covering defender. I’m not going to dig up the statistics — it’s your idea, after all — on whether or not covering defenders commit more or fewer tackles, although I guess it might be interesting to know. To reiterate, you haven’t provided any context behind the stats. What does winning blocks have to do with being a covering defender? You haven’t provided any context behind that statistic, such as where the blocks are being made. Moreover, why is that stat important for a covering defender? Why is it important for a team playing a high line? I’ve asked this question a couple of times and it hasn’t been answered, so I will assume that it is a meaningless statistic –which it is. The same goes for clearances made. Fair enough on the tackles stat. I think you’ve proven that he prefers to stay on his feet on a team that doesn’t. You said that defending is about positioning. I think your article would have been better if you had provided pictures that show where Cahill positions himself during transitions and while defending during attacking play.